The weight of the gold that Solomon received yearly was 666 talents, not including the revenues from merchants and traders and from all the Arabian kings and the governors of the land. King Solomon made two hundred large shields of hammered gold; six hundred bekas of gold went into each shield. He also made three hundred small shields of hammered gold, with three minas of gold in each shield. The king put them in the Palace of the Forest of Lebanon. Then the king made a great throne inlaid with ivory and overlaid with fine gold. The throne had six steps, and its back had a rounded top. On both sides of the seat were armrests, with a lion standing beside each of them. Twelve lions stood on the six steps, one at either end of each step. Nothing like it had ever been made for any other kingdom. All King Solomon's goblets were gold, and all the household articles in the Palace of the Forest of Lebanon were pure gold. Nothing was made of silver, because silver was considered of little value in Solomon's days. The king had a fleet of ships of Tarshish at sea along with the ships of Hiram. Once every three years it returned carrying gold, silver and ivory, and apes and baboons. King Solomon was greater in riches and wisdom than all the other kings of the earth. 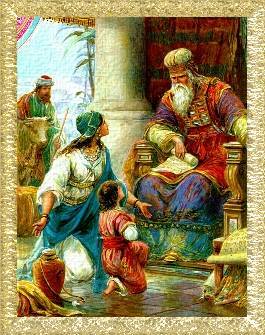 The whole world sought audience with Solomon to hear the wisdom God had put in his heart. Year after year, everyone who came brought a gift--articles of silver and gold, robes, weapons and spices, and horses and mules. Then Jesus said to his disciples: "Therefore I tell you, do not worry about your life, what you will eat; or about your body, what you will wear. Life is more than food, and the body more than clothes. Consider the ravens: They do not sow or reap, they have no storeroom or barn; yet God feeds them. And how much more valuable you are than birds! Who of you by worrying can add a single hour to your life? Since you cannot do this very little thing, why do you worry about the rest? "Consider how the lilies grow. They do not labor or spin. Yet I tell you, not even Solomon in all his glory was dressed like one of these. If that is how God clothes the grass of the field, which is here today, and tomorrow is thrown into the fire, how much more will he clothe you, O you of little faith! And do not set your heart on what you will eat or drink; do not worry about it. For the pagan world runs after all such things, and your Father knows that you need them. But seek his kingdom, and these things will be given to you as well. "Do not be afraid, little flock, for your Father has been pleased to give you the kingdom. Sell your possessions and give to the poor. Provide purses for yourselves that will not wear out, a treasure in heaven that will not be exhausted, where no thief comes near and no moth destroys. For where your treasure is, there your heart will be also." In the Bible, "gold" symbolizes heavenly goodness, which is the deepest kind of goodness. "Silver" symbolizes the truth that goes with it, which is spiritual goodness. "Brass" symbolizes natural goodness, which is the most outward kind of goodness, and "iron" symbolizes the truth that goes with it, which is natural truth. Metals have these meanings from correspondences. In heaven, many things are seen shining as if from gold and silver, and many things are also seen shining as if from brass and iron. There, they know that these things symbolize the good and true things I just mentioned. This is why the ancients, who knew correspondences, named the ages according to these metals. They called the first age "golden" because innocence and love, and the resulting wisdom, reigned then. They called second age "silver" because truth from that goodness, or spiritual goodness, and the resulting intelligence reigned then. They called the third age "bronze" or "copper" because mere natural goodness, which is justice and sincerity of moral life, reigned then. And they called the last age "iron" because mere truth without good reigned then; and when that rules, falsity also rules. All of this came from the spiritual meaning of these metals. Have you had enough of battles and wars and trials and temptations? In our journey through the Bible, we have been going through some tough times in the last couple of months. Starting with the enslavement of the Children of Israel in Egypt, the story has been one long struggle with only a few pauses here and there. Breaking free from the Egyptian slavery under the leadership of Moses. Forty years of wandering in the desert, facing enemies all along the way. The initial conquest of the Holy Land under Joshua. The period of the Judges, when one enemy after another rose up against the Israelites, and the Lord raised up heroes such as Gideon and Samson to subdue them. The first two kings of Israel, Saul and David, whose reigns were spent conquering the remaining enemies of Israel and enlarging their territory to its greatest extent ever. The story line of the Bible from the beginning of the Book of Exodus through the end of 2 Samuel is filled with battles. As we've explored in the sermons over the past couple of months, our lives can feel that way, too. There are times when we face one personal battle after another. Sometimes we feel that we are making progress; other times we feel that we will be stuck in these struggles forever, with no end in sight. And that can get very discouraging. And yet, just as the six days of labor give way to the seventh day of rest, our "six days" of labor give way to a seventh day of inner, spiritual rest. The Israelites spent forty years wandering in the desert, facing heat and drought, hunger and enemies. Then they were led across the Jordan to their Holy Land. Later, King David reigned for forty years--a reign full of battles against the Israelites' enemies on all sides. These battles prepared the way for the glorious and peaceful reign of King Solomon. In each case, the forty years represented our time of trial and temptation, which eventually leads to a time of peace and fulfillment. In fact, in the original Hebrew, the very name "Solomon" means "peace." As long as his reign lasted, there was peace in the land of Israel. This reign of peace also ushered in a time of great prosperity, so that in the history of Israel, Solomon became synonymous not only with peace and with wisdom, but with glory, wealth, and splendor. Solomon built the first and only navy that the Israelites ever had. It was not a navy of warships, but rather of trading ships--what we would today call a merchant marine. Solomon's trading ships sailed to distant lands procuring precious metals, ivory, fine hardwoods, and exotic animals. Solomon also traded by land with all the neighboring nations. His land lay at the crossroads of Africa, Asia, and Europe, which meant that he could make a handsome profit for his kingdom by importing and exporting horses and other valuable trade items, as well as taking tribute from merchant caravans passing through. As I was reading about Solomon's glory, one verse jumped out at me: "All King Solomon's goblets were gold, and all the household articles in the Palace of the Forest of Lebanon were pure gold. Nothing was made of silver, because silver was considered of little value in Solomon's days." A few verses after our reading, it explains why silver was considered of little value: "The king made silver as common in Jerusalem as stones." It's not that people didn't appreciate the qualities of silver; rather, there was so much of it around that it was practically taken for granted. The royal court, of course, would have only the finest of materials for its utensils. And silver being as commonplace as it was, everything in Solomon's court was made of pure gold. In a very literal sense, the reign of Solomon was a "golden age." The glory of Solomon's reign did not last. Yes, he also was on the throne for forty years--a good long time for a king to reign in those days. But despite his wisdom, he allowed all that wealth and power to go to his head. His excesses paved the way for the breakup of the nation soon after his death. From there, the history of the Israelites was all down hill. Our times of peace and spiritual rest usually don't last either--at least, not while we are still living here on earth. Yes, there are a few people in the "golden age" of their lives who have apparently completed their battles, and who finish out their lives in a state of great inner peace and contentment. But for most of us, after a plateau when things move along smoothly for us, it is back to the grindstone of emotional and spiritual labor. Still, one of the Ten Commandments is to "remember the Sabbath day, to keep it holy." And when we do have those times of rest, we squander that gift from the Lord if we spend our time worrying about how long it will last, and what will come at us next. In our times of rest, it is best simply to rest, enjoy the blessings the Lord has given us, and give thanks for this foretaste of heaven right here on earth. Today, I would like to move beyond the dark shadows of spiritual war that we have been engaging in lately, and look at what brings us to peace after those inner wars are over. Of course, one of the things that brings peace is the successful completion of the war itself. For Israel, it was only after they had conquered all of the enemies in the land, and put to tribute many of the surrounding peoples, that they were at last able to enjoy peace in their land. For the time being at least, no enemy threatened them anymore. The wars we face are against our inner enemies: our self-centered tendencies, our materialistic desires, our old, faulty habit patterns of thinking, feeling, and acting that continually rise up against us, trying to tear us down. We enjoy our times of peace when we have at last subdued some major inner enemy, and can enjoy the serenity of not having to contend with it anymore. To use a fairly common example, let's consider a marriage that is going through a period of strain. The two are not communicating well with one another. Each feels overworked and under-appreciated. Due to the tensions, small issues get magnified. Most of the time it is under control, but sometimes tempers flare. The inner resentments that have been building up in each burst out into open conflict. There are emotional casualties on both sides from these battles. And if things continue in this way without a conscious effort toward resolution and reconciliation, it will eventually lead to the breakup of the marriage. Let's say this particular couple decides they do not want that to happen. Now it is a matter of seeking out some approach to understand and deal with the conflicts that have developed. Perhaps they go to counseling. Perhaps they go to marriage enrichment workshops or read self-help books on how to improve relationships. Perhaps they simply spend some intensive time together consciously working out their differences. This, too, is a struggle. Because if we truly wish to improve our relationships, it is necessary to turn the battle that was formerly with our partner inward, and battle those parts of ourselves that are keeping us from being in loving, harmonious relationship with our partner. We may have to stop thinking so much about our own hurt feelings and pay more attention to the ways our partner feels neglected, unappreciated, and unloved. When we are used to focusing on our own feelings, it can be hard to redirect our attention. Of course, for different people and different couples the battles will be different. But if they are winning battles, they will always involve personal change and growth in each partner. At first it takes a lot of conscious effort and a great deal of inner struggle to change our attitudes and our approach, so that we can start thinking, feeling, and acting in a new and better way. We may be tempted to give up and fall back into our old patterns, thinking that it will always be a struggle, and it is just not worth it. But if we persist, a wonderful thing happens! At first it was an effort to say a kind word instead of a jealous one, to say thank you instead of taking our partner's efforts for granted, to pitch in and help where formerly we would have dragged our feet. But more and more, we find that we enjoy all of these new ways of being. Instead of feeling like these are irksome tasks that we must force ourselves to do, we begin to take joy and pleasure in showing thoughtfulness and love to our partner. One day we will suddenly discover that it has ceased to be a struggle. In fact, we no longer even have to think about it. Because now we love to pitch in, to say thank you, to offer an encouraging word. It gives us an inner peace and joy that we had never experienced before. We feel a new richness of spiritual life, both within ourselves and in our relationship with our partner. We have arrived at our own "golden age" of peace and love, when the "silver" of enlightened thought and mutual understanding is so commonplace that we no longer even think about it. This is the meaning of Solomon making silver as common as stones. And the gold that all of his goblets and household articles were made of is the gold of mutual love. It is only when we arrive at a stage in our lives where we are acting from love--love for God and love for one another--that we experience true peace. Isn't this what our struggles are all about? Learning to understand one another better, to love one another better, and to love God above all? These are the treasures that we store up for ourselves in heaven, which will bless us with eternal peace--the peace of the angels. Peace in the heavens is the divine nature deeply affecting everything good there with blessedness. So it is the source of all the joy of heaven. In its essence, it is the divine joy of the Lord's divine love, arising from his union with heaven and with every person there. This joy, which is perceived by the Lord in the angels and by the angels from the Lord, is peace. It flows down from there to provide angels with everything that is blessed, delightful, and happy--what we call "heavenly joy." When angels are in a state of love they are in a state of peace, because this is when the good within them is united to what is true. Much the same is true of us when we are being reborn. When a union of what is good and true takes place within us, which mainly happens after the struggles of temptation, we come into a state of delight that arises from heavenly peace. This peace is like the morning time or dawn in the spring, when, once the night has passed, all things of earth begin to take new life from the rising of the sun. The dew that falls from heaven spreads a leafy fragrance far and wide, and springtime's gentle warmth makes meadows fertile, and instills its charm in human minds as well. This is because morning or dawn in springtime corresponds to the state of peace of the angels in heaven. This is the beautiful promise that our church makes to us about the morning and the springtime that will come after the night and winter of our struggles here on earth. Though Swedenborg is describing the peace of the angels, we do not have to wait till after we die to get a taste of it. "When the angels are in a state of love," Swedenborg writes, "they are in a state of peace." We can create a "state of love" right here on earth. We can continue seeking love, moving toward love, showing love to those around us. When we feel that warm and generous love welling up inside us, then we feel the peace of the angels. And then we are clothed in a God-given glory far beyond anything Solomon knew. Amen.